Yums! Today 小小宝贝 has graduated from having one meal (breakfast) of solid food to 2 meals (and dinner). The ultimate aim is to serve him solid food for all 3 meals, while cutting down on his milk, which will eventually not be able to fulfill his needs. He’s currently still taking all milk feeds on top of his meals. 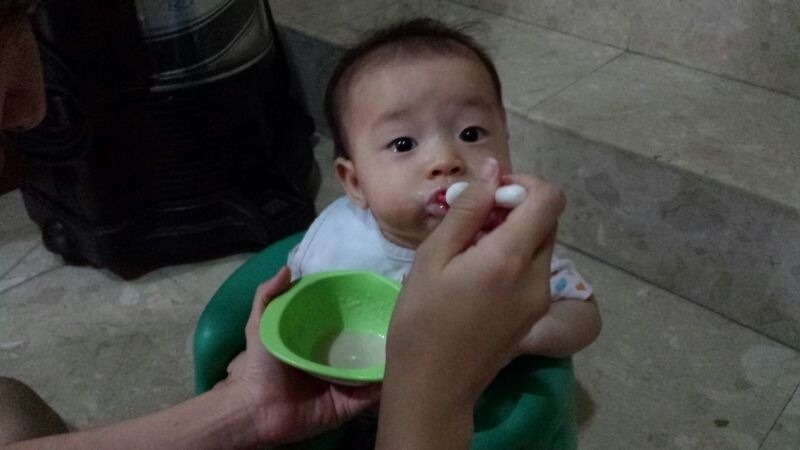 Today is the 3rd day of his first food – brown rice cereal. 3 teaspoons of cereal for breakfast and lunch. He’s been eating up the cereal in record time. He’s probably a food lover just like his elder sis! Tomorrow he will be trying another low allergenic food for the first time.